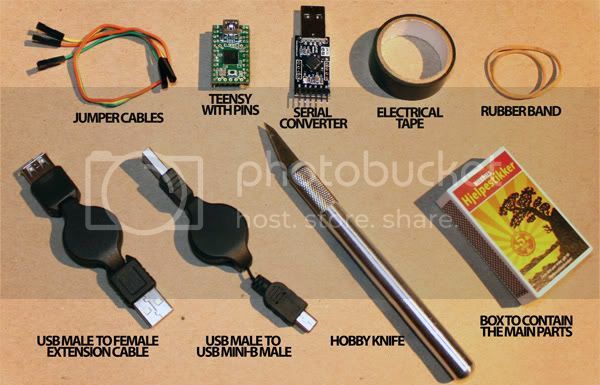 Welcome to the straight-to-the-point tutorial on how to build the GIMX PC to PS3 USB adapter, solderless! Everything you need to know to build and get started with the adapter is covered here if you read it carefully! I suggest you read it through at least once, just to have a heads up on what you're going to do. It should come with a set of cables and look like this. You need the one with pins to be able to connect everything without soldering. A project box to contain all the parts. I'll be using a match box for this tutorial. Another popular DIY project box is an empty Altoids tin for example. For insulating or securing parts and cables in place. Regular adhesive tape should work as well. For bundling everything up - easy to undo and redo if you don't get it right the first time. And hopefully you have some basic tools like a [b]hobby/utility knife[/b] or scissors laying around. See this video for some important installation instructions! To begin with, I recommend you insulate the serial converter using the electrical tape if it's going to be in a tight enclosure, to avoid any shorts between it and the Teensy. Now connect the cables as shown in the picture below. The next two steps are only required if you're putting the parts in a very tight enclosure and need the parts to take up as little space as possible. 1. Bend the pins with the jumper cables attached to them inwards, slowly to prevent them from snapping, and tuck the cables between the pins on the opposite side. 2. To save some extra space, I usually wrap the cables around the Teensy. There's no special way of doing this, so you just need to figure out what works best for your build. Remember not to cover up the button on the Teensy as we need to press it later on. If you want, you can also place the serial converter so that the pins and jumper cables go in between the rows of pins on the Teensy. It's a very snug fit though so you should use some electrical tape to insulate the pins on the serial converter because they will touch the Teensy ones if you don't. Cut some holes in your project box of choice to match the Mini USB plug on one side and regular USB plug on the other side. Voilà! You're done building the adapter. Connect the adapter to your computer using the USB Mini-B cable and a LED on the Teensy should turn on or start blinking. Press the button on the Teensy and the LED should turn off. In Teensy Loader, open atmega32u4.hex from the firmwares folder on your desktop. Click the Program button and you should get the message "Download Complete"
Now click the Reboot button and your GIMX USB adapter is ready for use! NOTE! You can now unplug the USB Mini-B cable from your computer. The USB Mini-B cable will only be connected to your computer when upgrading the firmware from now on. When in use, the USB Mini-B cable is connected to your console. Simply run setup-0.30.exe from your desktop and follow the installation steps, preferably with the default installation location. When the installation is done you should have three GIMX icons on your desktop. You can also check out the Configuration Requests and Index thread for other configurations available for download, or post requests that we or the community might be able to fulfill. For Windows 32bit, downloaded configurations go in the C:\Program Files\GIMX\config folder. For Windows 64bit, downloaded configurations go in the C:\Program Files (x86)\GIMX\config folder. That's it. You're ready to start using the GIMX USB adapter! This is of course only required the very first time you use the adapter! 2. Connect the USB Mini-B side to your console, run gimx-serial and make sure the adapter is recognized on a COM port. 3. Select the config you made/downloaded from the drop down menu, click the Start button and a couple of windows should pop up to start capturing your mouse and keyboard input! Now if you're in the menus of your console and press the WASD or arrow keys on your keyboard, you should be able to navigate through the menus, meaning you've succeeded! If not, or if something went wrong elsewhere, go back and make sure you followed every step to the letter and try again, then let us know if nothing you try works. Holy, this is awesome, great tutorial McKack! It'll help a lot. Is the extension cable mandatory, if I can reach the ps3 without it? I have heard the Ft232rl works, but this one's a female. Could a male-male extension cable make this work, in order to plug it in? 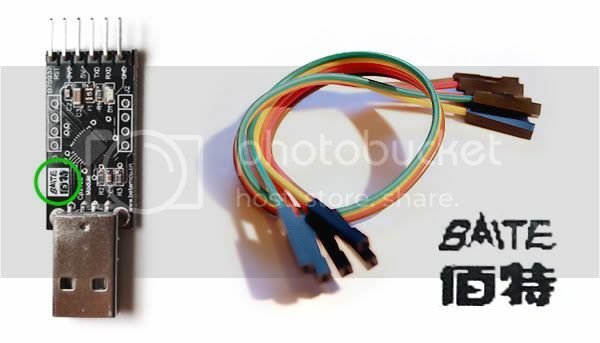 Also, there's another problem of figuring out where to plug the jumper cables on this converter board, since it's different from the pictured one -- how am I to find out which pin to plug the jumper cables to? What do you think about the Teensy ++ boards? They seem to have more memory and a better processor... wondering if this would reduce latency. Please read the title: the goal of this tutorial is not to overwhelm people with details, like telling every piece of hardware that will work. If you want details about compatible hardware: link. A teensy 2.0 + cp2102 is the optimal setup for GIMX. Indread wrote: Is the extension cable mandatory, if I can reach the ps3 without it? Not needed in that case. I don't use one either since I have my main PC and laptop right next to the PS3. And what Matlo said, this specific guide will focus on as few parts as possible. I'm still probably going to try and refine and strip it down even more when it's completely done because I've gotten a few messages from people that still think it looks complicated. Thank you. Going to fine tune and finish it this weekend. Oh man. This is sick. I'm all setup and going good with Linux, but now I can get my buddies setup with GIMx without the hassle of them installing Linux on their PC's and Laptops.